Antivirus & Antispam eliminates all types of threats, including viruses, rootkits, worms and spyware and stops spam and phishing attempts with high interception rates. Meets the needs of complex network infrastructure. Optimized for Virtual environments, with Snapshot Independence and Native Clustering support. Stops spam and phishing attempts, with high interception rates. Ready to run after installation without further configuration. Offers a wide range of combinations for handling every message, using standard and advanced parameters including previous anti-spam filtering or antivirus scanner results. Administrators can choose which databases and mailboxes will be scanned. Smart scanning allows server resources to be conserved. 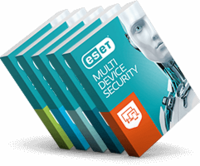 ESET updates and program modules can be stored outside of the default location – so updates and modules don’t have to be downloaded every time a virtual machine is reverted to an earlier snapshot. 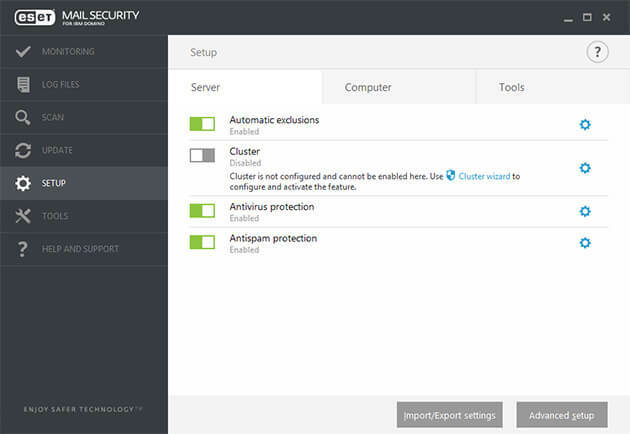 Interconnect several installed nodes of ESET Mail Security within a cluster and manage them as one, eliminating the need to replicate changes in configuration manually. 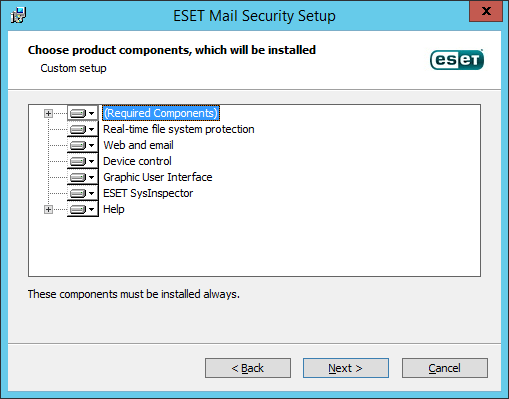 Monitors key functionalities of ESET Mail Security via WMI framework. 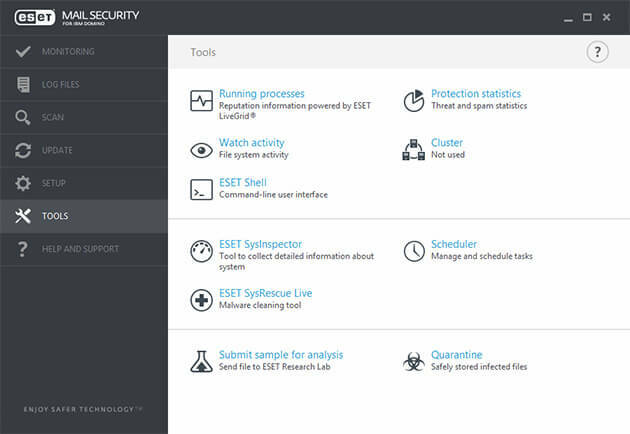 This allows integration of ESET Mail Security into third-party management and SIEM software. Updates and actualizations are downloaded and applied incrementally in small packages, conserving system resources and internet bandwidth without any noticeable impact. 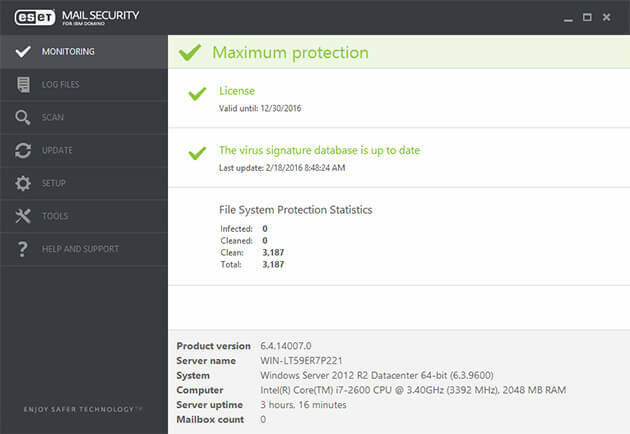 Install on the components you need, including Real-Time File System Protection, Web and Email Protection, Device Control, and more. 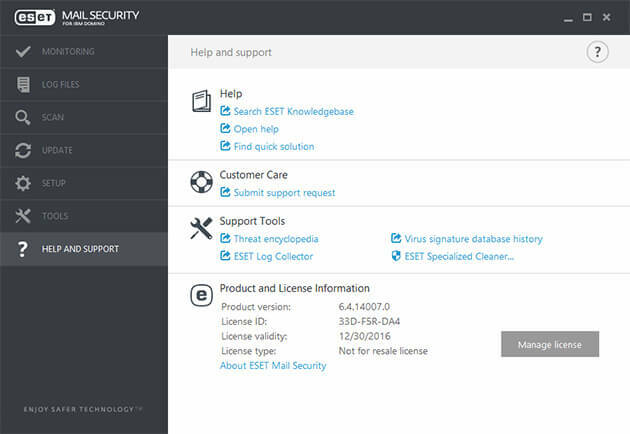 ESET Mail Security comes fully manageable via ESET Remote Administrator, delivering a perfect “look & see” overview of the network security status. Handle all licenses via web browser, transparently from one place, merging, delegating and managing them in real-time.